1) Degree-granting institutions comprising universities, university run institutes, laboratories and schools. 2) Synchrotron and neutron research centers. In both cases use is for research purposes and not for commercial clients of the institution. TOPAS-Academic comprises all the functionality of BRUKER-AXS TOPAS operating in Launch mode including all graphics and OpenGL structure editor and viewer. Launch mode is where the full functionality of TOPAS is realized. Tutorials describing the functionality of TOPAS-Academic, courtesy of John Evans, can be found here. Power users of BRUKER-AXS TOPAS use Launch mode where data input is through an editor for writing the input script known as INP format. Equipped with a good editor and help system the writing of INP scripts is straight forward. Editors are a personal choice and it would be unwise to expect all users to settle for any particular one. However in an effort to standardize the editing of INP files and to encourage the use of a good editor and the sharing of editor macors the open source editor jEdit (licensed under GNU General Public License, GNU GPL) is recommended. John Evans involvement in TOPAS-Academic continues with unending support. His many ideas, suggestions, tutorials and rigorous testing has led to a multitude of breakthroughs and impovements. There’s no difference between the kernel of TA and Bruker-AXS TOPAS for the same version number. TA will always comprise the latest kernel. There are no differences in regards to single crystal refinement, structure solution, neutron TOF and non-standard Rietveld refinement. There are some differences in how data input is handled for peak fitting as seen in the tutorials here. For standard Rietveld refinement then TOPAS offers the use of Windows dialogs. Indexing is different but on the whole similar - again see the tutorials here. Each license will run one instance of the program on a specific computer. More than one person can of course use that computer but not at the same time; TA.EXE and TC.EXE can be both run at the same time. 10% VAT is charged for Australian customers only. Support regarding suggested techniques and porgram operation is generously given via e-mail. However the whole sale solving of problems requiring sometimes days of work is not support; it is consulting and customers will be charged accordingly. Send an e-mail to AlanCoelho@bigpond. Include a university web address displaying your e-mail address. PhD students should supply their supervisor or department's head web and e-mail address. Additional suggestions for verifying your academic status are considered. An invoice is sent to the buyer. The buyer pays by bank transfer or credit card. The Australian business details can be obtained from an Australian Government web site using the Australian Business Number listed at the top of this page. BRUKER-AXS for recognisng the needs of the scientifc community and granting permanent use of TOPAS code in TOPAS-Academic. John Evans for continuous support, testing and guidance in the development of TA's functionality. Works with powder or single crystal data. Tangent formula can be used in each CF iteration. For powder data the A matrix from a Pawley refinement can be used to attribute intensities to E-values each CF iteration. A new electron density atom picking routine that is both fast and independent of atom size. Can operate in any space group and not just P1. Space group symmetry restraints can be applied to the electron density each CF iteration. Further options include Histogram Matching, Low Density Elimination and the Random Omitting and Insertion of atoms. Real time OpenGL display of electron density with atom picking. Computer algebra control for up to 30 CF parameters. For x-ray or neutron single crystal or powder data. 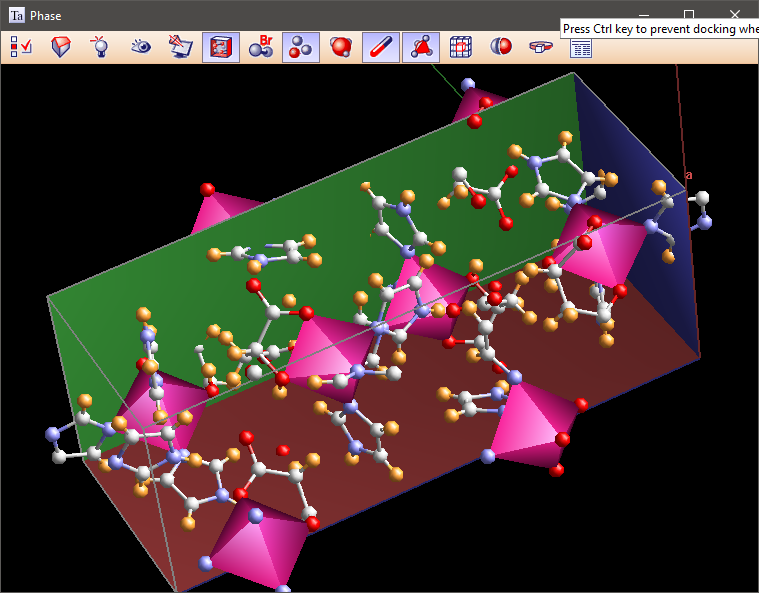 Calculated from standard TOPAS INP files with an OpenGL display showing the electron density cloud, structure and picked atoms. Allows for enlargement of the Ewald sphere with Fobs set to Fcalc. Implementation of the Flack parameter. Ouput of more single crystal details with phase symmetry considered. Bootstrap errors for fractional coordinates that are a function of a rigid body. Enhanced computer algebra routines whereby 10s of thousands of equations can be loaded and simplified without difficulty. Each node of an equation requires on average 10 bytes of memory. INP files are more rigorously validated, for example, parameter input such as 1/3 are now disallowed; instead an equation such as =1/3; is necessary. In addition parameters that cannot be a function of multivalued parameters are now checked. For example, an x coordinate written in terms of H, K, L etc... will throw an exception. Validation is also performed regarding the type of multivalued parameters used in equations. For example, the fourier_map_formula can only be a function of its multivalued parameters of Fobs, Fcalc and D_spacing. Overall speed has increased and refinement convergence improved. All refinements should converge in a more robust and often quicker manner. This is due to an automatic Marquardt constant determination and the calling of the very fast BCCG routine twice to solve the normal equations were parameter limits violated. A completely rewritten version of the BFGS method for approximating the Hessian matrix. This Quasi-Newton method has been modified to dampen changes in the system in early iterations of a refinement. It converges better in cases where the minima is far off. It's convergence in general on smaller structure refinement problems is comparable in time to that of the fully calculated Hessian matrix. Together with a reworking of the automatic parameter removal scheme structure solution can now progress at a rapid pace. Version 4 solves structures that version 3 could not. The BFGS method together with aggressive memory conservation techniques now allow for refinements comprising tens of thousands of parameters. Refinements of this sort were not possible with version 3. The bootstrap method of error determination has been implemented; it can be used to determine esds and in particular errors can be estimated for very large problems where matrix inversion is impractical. Reworked simulated annealing and automatic temperature regime algorithms that in most cases finds the global minima far quicker than before. In many cases the new version finds global minima missed by the previous version. Faster and more accurate convolutions in most cases. New convolutions for	describing peak shapes resulting from the use of linear position sensitive detectors and capillaries. Each of these convolutions corrects for peak shape, peak position and peak intensity. The inclusion of torsion angle penalties to complement previous distance and angle restraints. Improved convergence for phase penalties. Preliminary tests have shown that only nine phase penalties are required to solve a centrosymmetric structure comprising 43 atoms in the asymmetric unit in a period of minutes. Further tests indicate that phase penalties can be used to determine phases from non-centrosymmetric structures. The Cloud - an atomic position averaging techniques that allows for the visual display of atomic movements. High density positions in the cloud can be searched and atomic positions extracted. Good for locating heavy elements or tracking atomic movements in general. A greatly improved Rigid Body Editor that can load and overlay rigid bodies, structures, clouds and INP files. An improved indexing algorithm that is both faster and more likely to find the right solution.